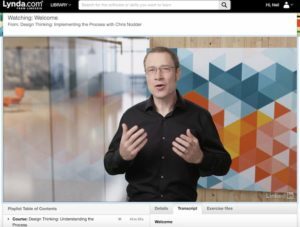 When I first wrote about the hands-on user experience training I had developed, I recommended one of Chris’ videos as an introduction to design thinking. I’ve since reviewed much more of what’s available via Lynda.com and really enjoyed his work in particular. I don’t think anything beats getting hand-on experience in UX-related techniques but if you’re unable to come along to the in-person training I’m providing then the resources from Lynda.com are probably the next best thing. I’ve found installing the Lynda app onto my tablet, and then downloading classes to watch offline to be particularly useful (as I commute and don’t always have good wifi) but there are of course other ways to consume the material. If you need help getting started with Lynda.com the Digital Skills team can support you. This playlist is for Edinburgh staff and students only, I’m afraid.